Securall cabinets are built to the highest quality specifications. Whether you are storing dangerous flammable chemicals or you need a cabinet for heavy industrial tools, we have the perfect cabinet for your needs. Securall is the industry leader in Fire Rated Storage. Securall's Chemical Storage Buildings (B1200 and below) are designed to fit in a standard high cube shipping container reducing shipping costs and labor time. Securall has developed a line of Explosive Storage Magazines for the storage of High Explosives, Low Explosives and Blasting Agents. Our Explosive Magazines are designed to meet or exceed federal standards developed by ATF. Our fully welded, heavy duty storm shelters not only offer secure protection, but also the Peace of Mind that comes with knowing that shelter is immediately accessible whenever you need it. Securall Storm Shelters & Safe Rooms are built in accordance with specifications set forth by FEMA, the National Storm Shelter Association (NSSA), and the International Code Council (ICC). Hazardous materials storage requires special handling and special containers. Chances are your business has a number of hazardous chemicals on-site-like gasoline, cleaning supplies and paint thinner - all of which require their own special safe storage solutions. Whether you're storing gas, oil or acid, we have the perfect storage soultion for your needs. If you have a special situation that requires a customized design, we will welcome the opportunity to work with you to provide a safe storage solution. View our standard Safety Storage Cabinets and Buildings. Or Request a Quote for a special situation that requires a custom Cabinet or Building . Why Should You Choose Securall? Securall strives to know and understand the most current codes and regulations, which dictate the use and build-design of Safety Storage Products. 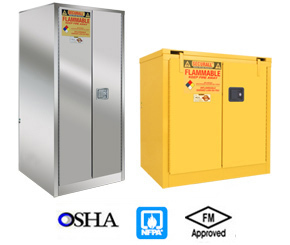 All Securall Safety Storage Cabinets comply with current OSHA regulations and are designed in accordance with the standards of NFPA Code 30. Popular models are FM Approved. Securall offers a complete line of Safety Storage Buildings specifically designed for outdoor hazardous material storage and dispensing from 55-gallon drums containing flammable or environmental waste liquids. Outer wall is constructed of all-welded 16 or 12 gauge steel. Inner wall is constructed of 20 gauge steel. The double wall construction contains 3" of air space throughout. All Models available with Explosion Relief Panels. All Models available with 2 and 4 hour fire rating upgrade. 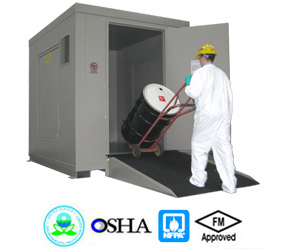 All Hazmat Storage Buildings are designed in accordance with the standards set forth by NFPA Code 30 and comply with OSHA and EPA regulations.